Every year, the greater Gig Harbor community celebrates the return of the salmon to our local waters. The Chum Festival serves to remind us that the quality of the water, and the habitat it supports, connects us all. Join festival hosts Harbor WildWatch and the Harbor History Museum, as well as community partners, for a fun afternoon of activities as we commit to new ways to improve and protect our waterways. This FREE Family friendly event is hosted at the Harbor History Museum on November 17, 2018 from 12:00pm-4:00pm. – Bring a t-shirt or blank tote bag and do some fish printing with Pierce Conservation District. – Touch some sea creatures or get your face painted with Harbor WildWatch. 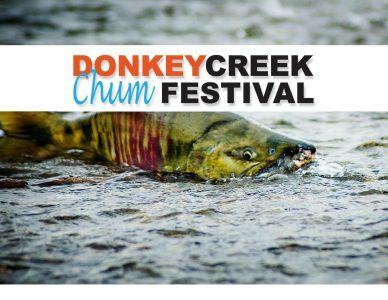 – Salmon Walking Tours at 1pm and 2pm will guide visitors through Austin Estuary and conclude at Donkey Creek Park where you can cheer the salmon on their journey.